I love picture books with simple words and phrases for both non-reading toddlers and even older elementary aged students. Well written picture books pack a lot of thought provoking, learning opportunities into small, easy to read packages. We were excited to review I Love Grass by Maria Boston. How did this book stand up to review in our little corner of the world? I received a complimentary copy of this book for use in our review. All opinions are our own and we may receive slight compensations from affiliate linking within our posts. Quick Summary of I Love Grass by Maria Boston. I Love Grass is a refreshing return to life’s simple pleasures. The book brings out the nature-lover in every child by calling their attention to this, and other, wonders of Earth. I Love Grass returns young readers to a simpler time of wonderment over the marvels of the natural world. The newly released book by children’s author Maria Boston is published by Outskirts Press. The first in a new series of children’s books, I Love Grass offers an alternative focus to today’s juvenile reader. The book draws their attention from the mind-numbing stimuli of electronics and computer-generated graphics back to organic things of beauty. It’s the story of one child’s excitement over something so simply ethereal – an oft-unnoticed and unappreciated patch of grass. Through this overlooked foliage, the young girl learns to appreciate the beauty of Earth’s abundance, and revels in the quiet presence of nature. I Love Grass inspires quiet introspection and helps lay the foundation necessary to build future generations of environmentally conscious adults. How exciting can a book about grass really be? This was the first question that my daughters and I asked. They are a little "too old" for picture books--and their digital, always on, constantly stimulated minds were a little hesitant at first to sit down and really read and review this book. Madelyn, our youngest, contributed her thoughts on the book along with my own thoughts this time. So--what did we think? Madelyn's Review of I Love Grass by Maria Boston. The book I Love Grass by Maria Boston is a great book about grass told by a little girl who lives in a suburban area. The little girl explains where grass grows, what grass looks like throughout the seasons, and many other things about grass. I think I Love Grass would be perfect for pre-school through kindergarten. Did you know that this was Maria Boston's first book? I think we should cheer her on to write another one! This Mama's Review of I Love Grass by Maria Boston. This book really brought a smile to my face as I listened to Madelyn read it aloud. I Love Grass helps readers slow down the day's pace--and refocus on simplicity. Madelyn, while looking for adventure, missed the sense of peace that the book brings as it encourages readers to focus on a piece of our daily surroundings so often missed and taken for granted. I think it's written for easy reading by younger students--but, it offers a wonderful launching point for parents and children (especially the older ones) to stop and observe nature. 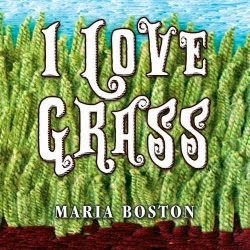 Would I recommend I Love Grass by Maria Boston? I Love Grass takes a fun look at something simple--and encourages parents and children to slow down, relax and take a look at grass as well. It's a cute book with yarnwork illustrations and a deeper message for families to share. Sometimes we need such books to remind us of the value (and the simplicity) of the world around us. I enjoyed the book and would certainly recommend it for families. Maria Boston has always written children's stories. She pulls on her rich experiences from her own and her daughters' childhoods. I Love Grass is her first published book. She lives in Virginia with her two daughters and their dog.